Ah, Wednesday. Back up to Colorado. Hopefully no fires this time. I am so loving the character of Joyce. Pulling in a tiny bit of every strong woman I’ve ever known or seen, Nej, Keylee, Terri, Kim, Mary, Bridget, Naomi, and on and on. Even visually, I can see parts of women I’m familiar with and care about, peeking out, Oona, Dylan, Siri, my mom, Helen Mirren. It’s a pleasure to try to bring these values and strengths of people I so admire to play. She reminds me of Jeane Kirkpatrick, former US ambassador to the UN. I repeat: Joyce is going to end up running the GOB. If she doesn’t, she’s going to be known throughout the galaxy as the Dread Pirate Joyce. This whole conversation reminded me of the “to the pain” scene in Princess Bride. 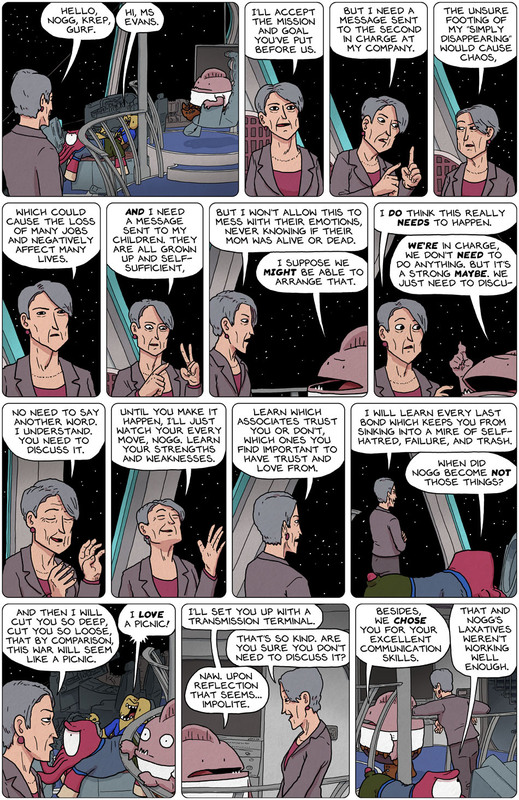 Didn’t realize it until you mentioned her, but Helen Mirren would be perfect to portray Joyce in the inevitable movie/series adaption of Spacetrawler. I love how Krep’s comment in the last panel magnified the effect of Nogg’s expression two panels before. Nicely played Christopher. Amazing that even with one eye, Krep can show such fear and respect in panel 13. Amazing handiwork, Chris. And so appropriate. I love to see people who dismiss strong women catch their poor assessment in the nads. Nogg, for all the abuse he gets, is damn good at picking crews (Dusty excepted, of course). Luck, technology or competence? Your writing style is sublime and a pleasure to read your prose, sir. Not so good when you don’t get the ones you were searching for. It can throw off the equation even by just one. I am thinking that I am going to enjoy this more than I did the last story, and I enjoyed that one immensely. I loved the previous story so much that I can’t believe the present story can be this good. The question Nogg should ask himself is: won’t Joyce do all that anyway? He may hold out hope that the cutting is the part that he might dissuade her from getting around to.